Jump in and enjoy some of The Sunshine State's refreshing fountains of youth. Come on down to the water and take a swim. You will feel younger. I guarantee it. Maybe it’s the laughter of children splashing or just the pure enchantment of these magical, mysterious places where time stops on a summer afternoon. Mermaids and manatees live here. So do the Creature From the Black Lagoon and all sorts of other wondrous things. You won’t find any of these watery treasures down at the beach. They hide away in forests and secret places. 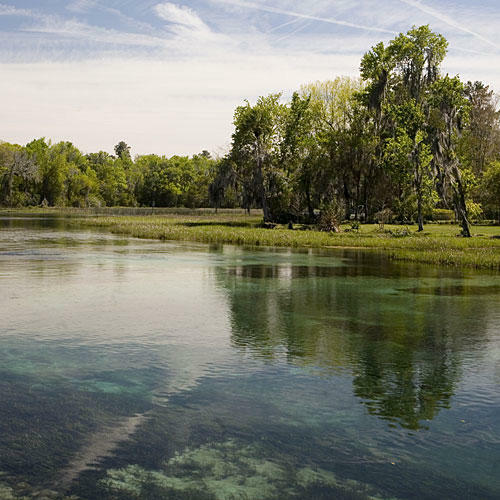 The world’s largest and most plentiful springs―more than 700 in all―gush in Florida. Senior Photographer Gary Clark and I spent weeks searching for the best. Here are some we think you’ll love. The water beneath us looks so clear you could read the headline of a magazine article if I set it on the bottom. An osprey sails overhead with a mullet in its talons. 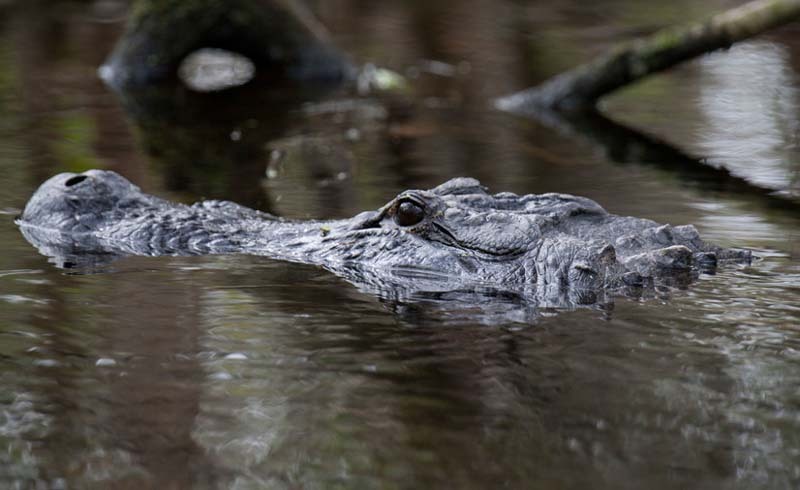 Not far away a 6-foot-long alligator lounges on an island not much larger than he is. “We’re right in the middle of real Florida,” park ranger Bob Thompson says as he guides a boat tour down the Wakulla River. Wakulla Springs, gushing more than 175,000 gallons a minute, forms the headwaters of the 9-mile-long river. It looks as wild as the Amazon this morning. Animals are everywhere. A moorhen whoops it up. Her staccato call―an often-used sound effect in jungle movies―sounds more like a chimpanzee than a bird. Another famous beast, the Creature From the Black Lagoon, starred in a classic sci-fi movie filmed here. Children leap off a diving platform (14 feet up) into the 68-degree swimming area near the headwaters of the spring. “Better than Disney,” wrote a traveler from South Africa who signed the memory book in room 22 of the lodge. The state park manages the retro, relaxing lodge, built in 1937 when the springs operated as a private attraction. Children love the vintage soda fountain, where families celebrate the end of a fun-filled day. Kayakers paddling the Silver River look as if they’re floating on air. 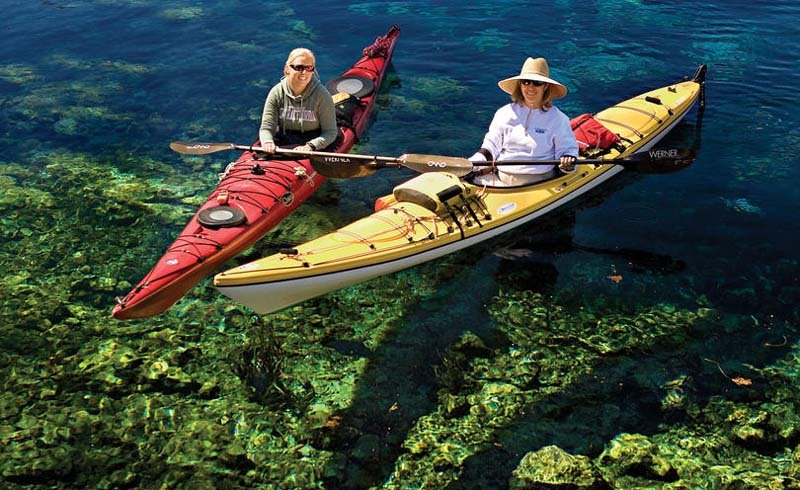 From a glass-bottom boat, I gaze down into the depths of Mammoth Spring. You don’t have to be a diver to see it. Just take a boat ride. 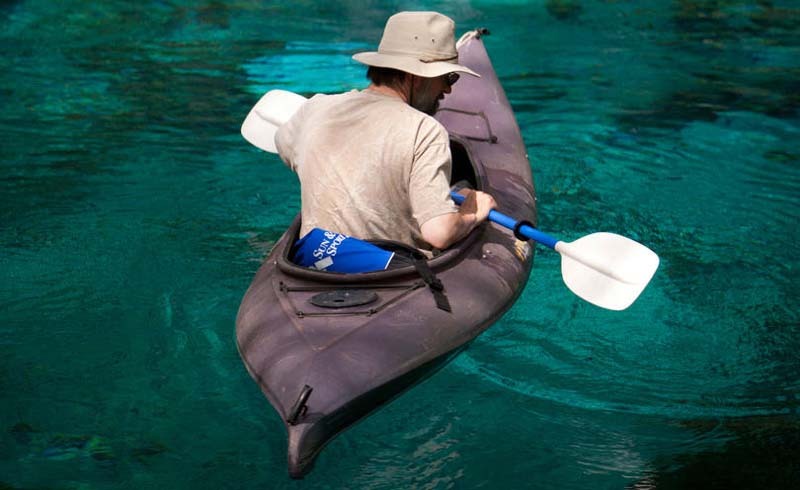 Glass-bottom boats were invented at Silver Springs in the 1870s, and the tours are still the most popular activity at the park. 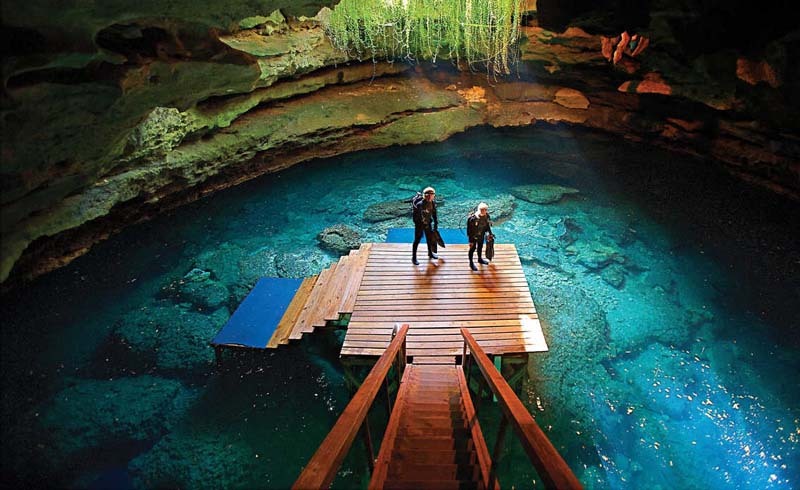 For years these crystalline waters flowing from seven major springs have starred in movies. You’ve probably seen them on the big screen pretending to be some faraway exotic paradise. A first-magnitude spring―one of the largest in the United States―gushes 550 million gallons a day. It’s a wonder to behold. Mesmerized, I pause on a hillside to admire the breathtaking oasis that surrounds the spring-fed pool at Rainbow Springs State Park. It’s one of the most eye-catching settings of any of the springs. Once privately owned, the 1,400-acre park features gardens and tumbling waterfalls. 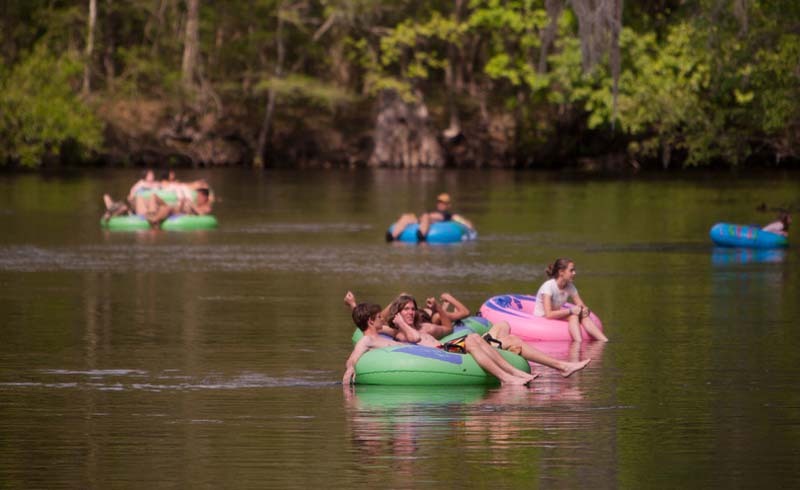 A 500-million-gallon spring feeds the Rainbow River, a popular place for tubing, kayaking in clear-bottom boats, snorkeling, and guided nature trips. “For the locals, this is our beach,” says park ranger Nicky Aiken. Tip: Try to visit on a weekday. This park―like most of the springs―gets its biggest crowds on weekends. The laughter of children spills out over the spring-fed swimming area. It’s the last week before school starts, and everyone wants to feel the bliss of these cool, 72-degree waters one more time before summer melts away. 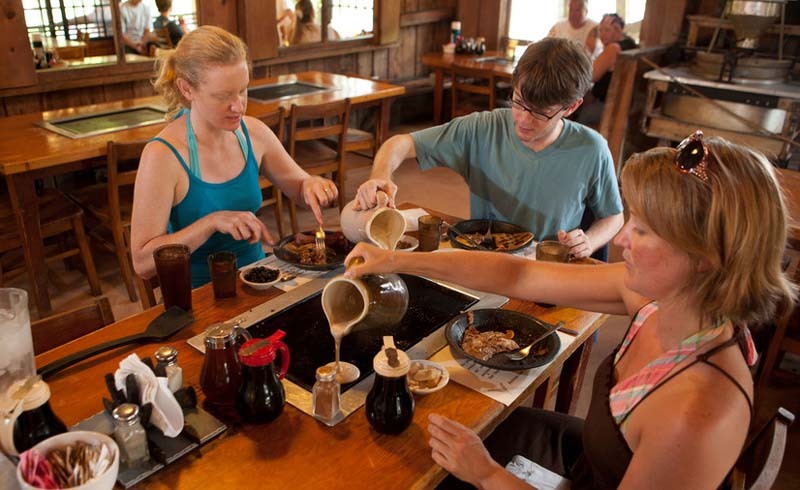 Take a swim, and then line up for breakfast at the Old Spanish Sugar Mill (pictured) to cook your own pancakes on a tabletop griddle. “My father had a bakery on Broadway in New York before he ran the Sugar Mill. He thought the griddles were a great way to stir up interest over food,” says Patty Schwarze, who runs the restaurant now. It worked. Families love it. The magic of nature surrounds a gushing spring at this park, 30 minutes from Orlando. On an early morning, I climb into a rented canoe and ease away from shore. When I follow the current through a tunnel of trees, four river otters swim out to greet me. I feel as if I’m in a Disney movie, but the critters here are real. Hard to believe this place of wild beauty thrives so close to an urban area, but it does, thanks to the nurturing springs. 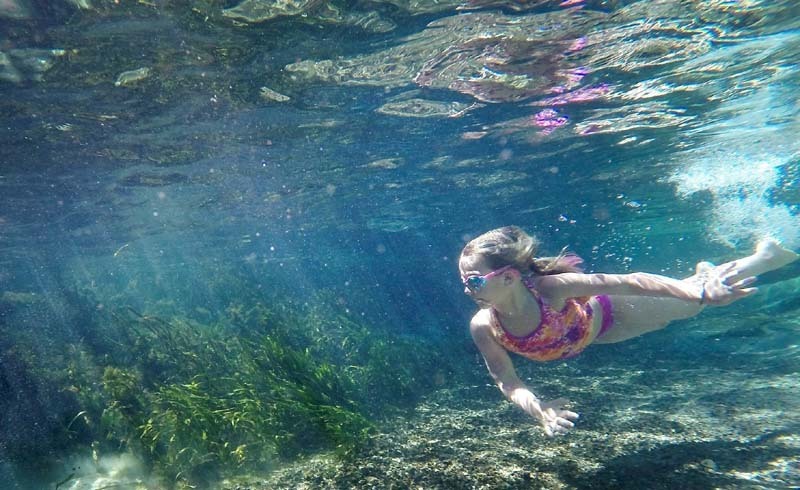 Rent a tube nearby, pay the $3 to $5 admission, and float the refreshing water of Rock Springs at this county park, a hidden treasure not far from Wekiwa Springs State Park. 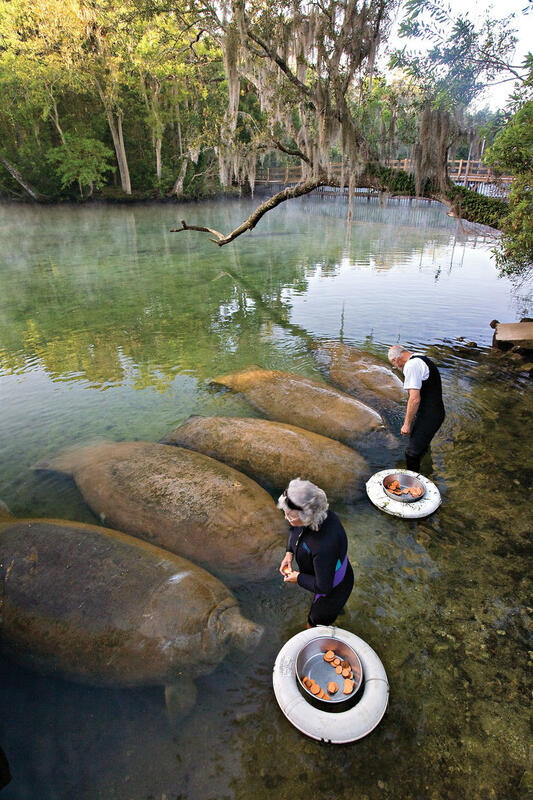 Manatees visit many of the state’s springs in winter, but you can see the gentle giants year-round at Homosassa Springs. Get here early, when they’re most active. Three feeding times daily serve each animal as much as 100 pounds of romaine lettuce and cabbage,as well as apples, bell peppers, carrots, and sweet potatoes. “I have a brother and a sister, but I’m the only mermaid in the family,” Stayce McConnell explains with a laugh backstage. 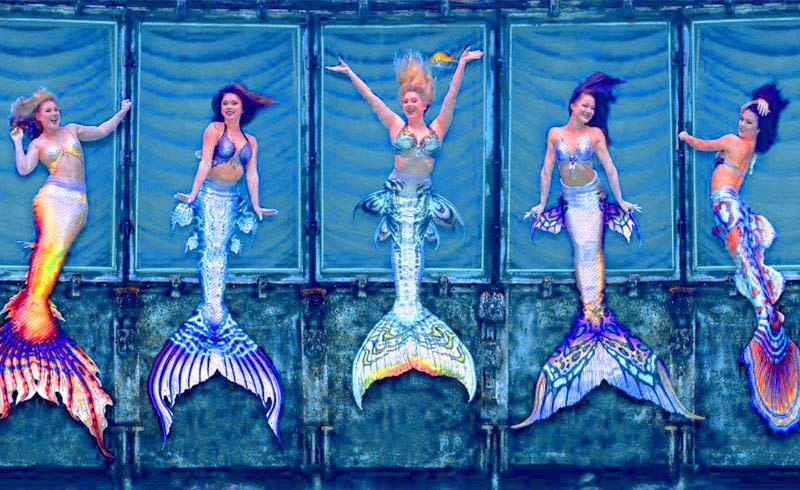 Then she adjusts her tail and dives into a 60-foot-long tunnel to star in The Little Mermaid show in the 500-seat underwater theater at Weeki Wachee Springs.